The weakness in the Eurozone core nations' economic activity (see discussion) is becoming more acute. Today's release of Markit construction PMI for Germany in fact looks bleak. Markit: - The downturn in German construction gathered pace in October, with the civil engineering subsector showing particular weakness over the month. Activity fell on the back of another sharp decline in inflows of new orders, and firms responded to reduced workloads by cutting staff numbers. Meanwhile, future expectations were the lowest since the depths of the global financial crisis in late 2008. Total construction work in Germany decreased at a faster rate in October, as signalled by the seasonally adjusted Germany Construction Purchasing Managers’ Index® (PMI®) – a single-figure snapshot of overall activity in the construction economy – dipping from September’s mark of 48.6 to 44.6. That was the lowest since July, and the eighth sub-50 reading in the past nine months. Even residential construction activity, which has been fairly strong up until recently, is facing a slowdown. Markit: - A solid decrease in residential building activity followed growth in the sub-sector during the previous survey period, while the latest downturns in commercial construction work and civil engineering activity were the steepest for three and eight months respectively. Germany's composite PMI that covers all sectors of the economy also came in below expectations with a trend that is showing an ongoing decline. Draghi has finally acknowledged that Germany is indeed facing a slowdown (see discussion) and can no longer be counted on to keep the Eurozone GDP growth from going into negative territory. CNBC: - The slowdown in the euro zone is now impacting Germany, European Central Bank President Mario Draghi said on Wednesday, warning that data shows that Europe's biggest economy is no longer shielded from the effects of the euro zone debt crisis. "Germany has so far been largely insulated from some of the difficulties elsewhere in the euro area. But the latest data suggest that these developments are now starting to affect the German economy," Draghi said. 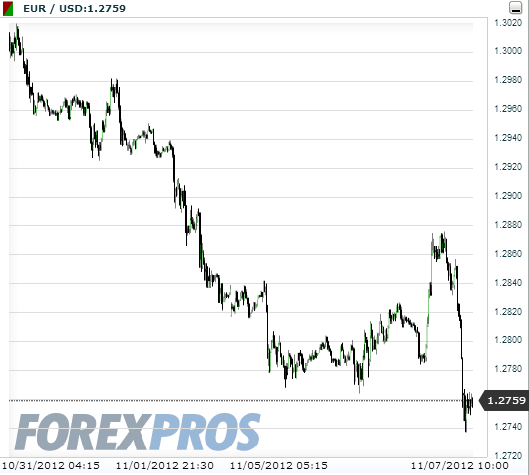 That news sent the euro sharply lower this morning, reversing earlier gains. Once again investors are coming to the realization that the ECB can not on its own solve the major economic and structural issues faced by the euro area nations and that the window of stability given to the Eurozone politicians could be fleeting.